Harman-Kardon BDS 800 review | What Hi-Fi? If you’re after an all-in-one system complete with Blu-ray that looks and sounds the part – and don’t mind paying for it – then Harman Kardon hopes the BDS 800 is what you’ll have in mind. We’re happy to tick the box marked stylish; the four nicely turned-out satellites, compact subwoofer and sleek, minimally designed Blu-ray receiver unit make for a smart package fit for any 21st-century pad. The satellites integrate a neat cable-management system, allowing you to tuck them out of sight behind a retractable panel on the rear of the speaker. All components are reassuringly solid. As for connectivity, you’ll find HDMI outputs but no HDMI ins, so you’ll have to settle for coaxial or optical if you want to connect another device. There are stereo analogue inputs and outputs, plus a USB input on the front for playing files from a memory stick. An ethernet port ensures you can connect to your network and access BD-Live content. The busy remote takes some getting used to, but it does function as a learning remote, capable of controlling your entire system given the right programming prods. There’s no auto-set-up but using a test tone and an SPL meter, the speakers don’t take much tweaking. We take a look at the unreal action on the Blu-ray of Tron and follow it up with the more natural colour palette offered by Up In The Air. We like what we see. There’s a hint of instability with the fastest motion but otherwise pictures are clean, colourful and deliver a nice balance between dark blacks and bright whites. Close-up shots reveal plenty of detail and natural skin tones are given plenty of texture. 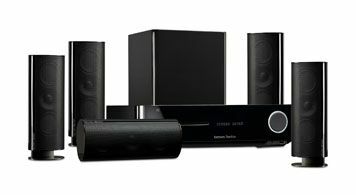 There’s decoding support for Dolby Digital and DTS, in standard definition and HD forms, and the end result is an even-handed, impressively large sound. Effects are steered around speedily and cohesively. It’s crisp, clear and detailed, and the sub is solid and well integrated. The centre channel can sound a little thick at times – we’d rather that than thin and bright – and it strains a little when really pushed, but our overall feeling is positive. Music lacks a little punch and excitement, but that’s a fairly standard trade-off for the convenience of an all-in-one system. Yes, you can get better performance from a separates system, but this is aimed at a different punter; one who values style and compact dimensions as readily as performance. We think plenty of those will be plenty happy with this BDS 800 system.